Quality internet performance is critical for any online activity. Be it an online business or entertainment. Better ping results, speedy and stable internet connections are some key fundamentals while determining the right modem to purchase. While purchasing a modem/router combo, reliability should be a top factor on your priority check. We tested a total of 20 modem/router combos in a bid to create a list of the top seven best modem combos in 2019. This review is meant to give you details concerning the seven that we found legible, quality and high performing. We thought that our guide would provide insight into making an informed purchase. In case you think this is for you, keep reading. The Motorola Surfboard N300 has four Ethernet ports of 10/100/1000 Gigabits. Supporting speeds of more than 686 Mbps, this doll is everything to go by. You will discover a wide array of significant internet providers support including the big names; Comcast, Time Warner Cable, Xfinity, Cox and Charter Spectrum. Therefore, if your standard ISP modem has been unreliable, this Motorola modem combo is the way to go. NetGear c300 is one of the most quality modem combo that you will find at a pocket-friendly price. This device includes eight downstream channels and is configured to support all ISPs in the US. Netgear also features stable download speeds of up to 340 Mbps. Where you think bypassing WIFI connection is the secret to high performance, the Gigabit Ethernet ports will deliver that solid connection. The TP-Link AC1750 delivers WIFI speeds of over 1750 Mbps. The connection cuts across between 2.4 GHz – 5.0 GHz band. Although the price is pretty high for this modem, it is one of the most sort after modems in 2019 due to its ability to share large files. TP-Link will optimize how you play games and transform your 4k content streaming experience. The NetGear N600 is designed for HD gamers and content streaming in particular. This modem works with Internet Service Providers like Comcast, Cox, Time Warner Cable and Xfinity. The device package also comes with Genie app that will help filter content. Hence taking your parental control efforts to a whole new level. The Motorola MG7550 is optimized for online business that works in high & low traffic environments. You will significantly reduce wire clutter and at the same time maximize your desk space. The vertical design has been known to extend the modem’s lifespan as well as improve cooling. The Nighthawk comes with a 1.6 GHz processor that boosts speeds and device performance. It is suitable for HD gaming and 4k movie streaming. The device is equipped with 10/100/1000 LAN Ethernet slots and x24 download speeds. The modem speed rises to 960 Mbps and a 1900 Mbps router (Dual Band). Fully optimized for DSL connections, this single band device well supports lightweight internet connections. If your situation and connection usage involve more than two people, then this device is not for you. The device is pretty pocket-friendly and basic. Check out the features and see whether it’s something you need. We hope that you will benefit from the above information. Use the guide to choose a modem/router combo that suits your home needs. 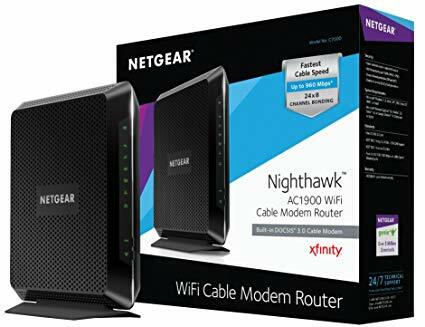 It doesn’t have to be high end; a good modem/router is one that provides reliable speeds and does not disconnect from your connection.